For the last three weeks, I have been experimenting on myself – attempting to get the majority of my nutrients in a powdered form. Why would I do such a thing and what did I learn which will change the way I eat forever? I was curious when a friend posted a picture of a liquid lunch and used the words DIY Soylent to describe it. After plunging into the hyperlinked rabbithole, there seemed to be non-commercial alternatives to buying all your food in a powdered form – a network of nutrition enthusiasts attempting to make cooking, cleaning and menu-planning redundant. The premise is simple: get the things your body needs into your body in as efficient a way as possible. Consistent, repeatable, quantifiable. These are the words that sprung to my mind, though you might think bland, repetitive, unappealing. As an alternative to stopping at a petrol station for a Twix thought, I thought it was worth trying. Since I’m always looking for a silver bullet, I hoped becoming a DIY soylentee would give me more consistent blood sugar, and fix all those hard to measure things like insulin spikes, HDL cholesterol levels and organ function in addition to helping me normalize my eating schedule and shrink a bit of my middle-aged Cadbury and Mr. Kipling spread. What did I eat before switching to soylent? I’m somewhat of a weekday vegetable and fish kind of eater, though on returning to the UK after an absence of ten years I had dived back into toast, crumpets and bacon too. I also found enough internal curiosity and little enough self-control to sample every new chocolate combination proposed by Nestle and Cadbury. I avoided dairy products, though was often tempted by whatever it was that my children would leave on their plates – from pizza to fishfingers to teacakes. My understanding on regularity of food intake had recently changed. I used to think 30g of protein was the maximum I could process at any meal, and that six meals a day would raise my metabolism and make me leaner and less mean. A cup of coffee would help me sit at my computer and if not exactly think, at least fool myself that I was being productive. Then I read that it doesn’t matter how often you eat in a given day, just what you eat. So like most people, I was bombarded with nutrition fiction and not sure exactly what to believe. What did I eat / drink in soylent? I didn’t spend a whole lot of time choosing a recipe, so at first I got it horribly wrong. I started with about 1800 calories a day with 40g of fiber. This made me think that I was dying for the first few days. I had to drink so much water to stay thirsty and every time I drank a glass of water, my insides turned into an aquarium oxygenator and I spent much of the day in the smallest room. On day three I had such a chronic pain in my left side and the inability to breathe properly that my wife wanted to take me to hospital. That turned out to be just a severe stitch – easily solved by hydration salts and several pints of water. I was also crabbier than a lobster and unable to think. So I changed what I was eating to something approximating 25% carbohydrates, 40% protein and 35% fat and about 2100 calories – appropriate for modest weight loss given that I run a few miles three or four times a week. The protein was first vanilla flavoured which made me dread mealtimes, so once I had absorbed all of that, I switched to chocolate. Other ingredients were a fine oat powder, virgin rapeseed oil (Canola in the US), lactase tablets and a bunch of vitamins, powders and supplements. Fiber came from psyllium husks. Every few days I’d weigh out some powders and put them in air-tight containers, and then at mealtimes I would stir in a few teaspoons of oil into 500ml of water and blend the lot. Stirring just made for gross lumpy misery. Blending was the way forward. So three blended shakes a day, chugged merrily. And a bunch of water. And of course, to completely throw my theoretically quantified nutrients, I would occasionally eat an apple, a slice of toast or some grapes. If I was only drinking meals, I would often feel a little queasy in the evenings and settle my stomach with toast. So I backed off to one or two blended drinks a day and a regular meal. That seems sustainable. How did I feel on powder? Consuming all your calories for the next four hours in a few minutes made me feel very awake. It was like my eyes would be propped open. I tried to continue drinking coffee but it made me feel jittery and too wired, so I cut down the caffeine to zero. I was never sleepy after my first few meals, and I felt more alive than after a solid meal. It’s hard to explain. Awake, but not particularly smart. Flushed and vigorous but a little vacant. It’s a bit like being awake at 4am after taking amphetamines – unable to think, unable to sleep. Once I cut down by 80% the amount of psyllium husks I was consuming, trips to the bathroom were enjoyable and without note. I slept fairly well. My libido seemed to plummet, as did my resting heart rate and blood pressure. So standing up quickly would result in loss of vision, and I’d occasionally feel tingling in my extremities. That’s about the time I went to one or more solid meals a day, which seemed to address the problem. Do I think living on powder is healthy? I think so. I’m always worried about whether my food choices have unintended consequences, though in general I try to eat well. My mother suffered a heart attack while I was drinking soylent, and she is very conscientious about how and what she eats. Diabetes and heart disease run in my family, and having seen my mother in hospital having tubes inserted into her arteries, I remind myself that the choices I make now can impact my family in the coming four or more decades I hope to be alive and thriving. Given the perpetual changes of opinion on what constitutes a healthy diet, I think that staying abreast of current research is important. And for those who can’t, find a trusted source of nutrition advice and being flexible with your beliefs is key. I didn’t get blood tests before and after my experiment, though I know people who have. Anything I present here is entirely anecdotal and not thorough or backed up by thousands of field studies. Yes, at first. Especially when cooking food for my family. That was simply mitigated by having a pint of soylent. Each meal added up to a little over two pints, so I could stave off hunger with the first pint, and then have the second pint at my leisure. Which meant that often I was feeding on the second pint of each meal when I wasn’t hungry. I baked an extremely indulgent chocolate birthday cake while I was powdering, and felt okay not eating it. I get chocolate at every meal – every boy’s dream. Did I lose weight with DIY soylent? Yes. In my short experiment I lost a little. In the first few days I lost a whole bunch. I’m guessing that was water weight and or brown weight – things hanging out in my gastrointestinal tract. I went from around 192 pounds to around 185 pounds. Subsequently, since reintroducing food I’ve stabilized at around 189 pounds. So not much change in weight really – losing about a pound a week. After measuring the outside of my body, that appears to be coming from belly fat, with not too much (if any) muscle loss. That’s how I would want it. My favorite side-effect of the experiment was that a breakfast of soylent has now become my go-to hangover cure. After a month of living alcohol free in September, I had a few drinks under the influence of soylent. Feeling pretty rough in the morning I would normally resort to a fried breakfast and a coke, and possibly some marmite on toast. Now I’ve discovered the healing power of powder, I’m going to stash away a few packets for morning after cures. I also became very appreciative of good food. I went to a college reunion dinner which blew the socks off my taste buds and made me appreciate fine dining in a way that I wouldn’t normally – the portions actually felt generous. At the other end of the gastronomic spectrum, possibly in the infra-red area, I went for a greasy fried breakfast and found myself physically unable to finish it – there was just no more space in my shrunken belly, and the indigestion was starting before I could finish. I was gassy at first, but that passed. Is soylent an expensive way to eat? If I could eliminate the need for refrigeration, grocery management and wastage and time and effort spent washing, cooking, cleaning kitchens and eliminate all my kitchen waste, the total financial cost of living on soylent would probably be lower than my typical grocery bill. That’s because I eat fresh vegetables and salmon by default. With my lifestyle – living with a family who enjoy meals and food and such, I couldn’t really get the extreme savings of removing a kitchen from my house. The diy soylent website has my food bill at £7 per day, but I think if you buy ingredients in bulk it comes down to about £5. I might cross check that later. The start up costs weren’t too high. I already had a blender. A set of kitchen scales (£12) wasn’t that much to buy, nor were six air tight containers (£10). The rapeseed oil came in a giant gallon jug (£20) and I only use about twelve teaspoons of that a day. And I also have a giant jug of multivitamins left over after three weeks – but these are all things that have enduring value to me. In short – yes – a bit. In principle I have found a drink I can enjoy. I’ve hopefully broken some of my smash and grab / snack and run habits, and I’ve learned a little more about nutrition. I wasn’t bored by the prospect of chugging chocolate flavoured lunches and breakfasts, and the work to create them wasn’t that high. 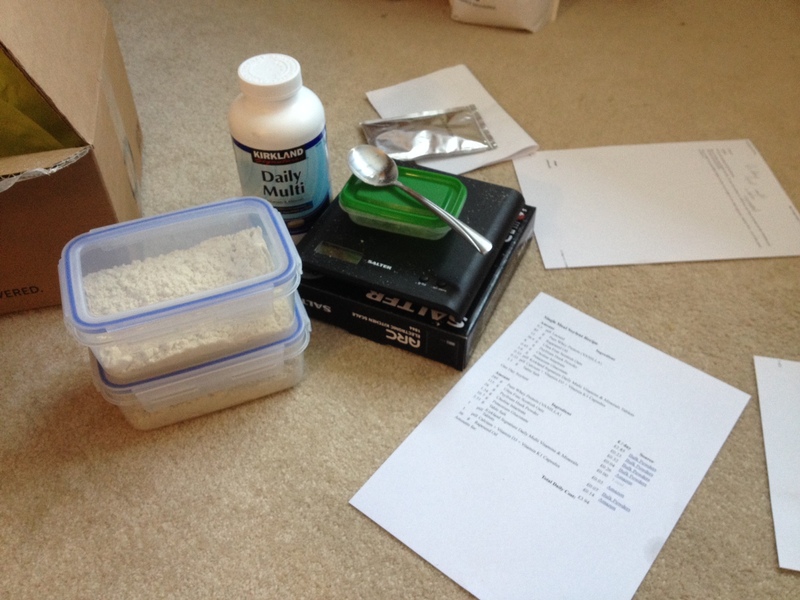 The ingredients can easily be delivered to my door from BULK POWDERS et al. I’ll continue to keep one foot in the powder camp, and I’ll make dinner and possibly lunch at home with my family. I’ll continue to go out with friends for food too.